UCU members are invited to take part in the National Senior Management Survey and help academics at University of Brighton shine a light on the ever-more centralised and unaccountable senior management in higher education. 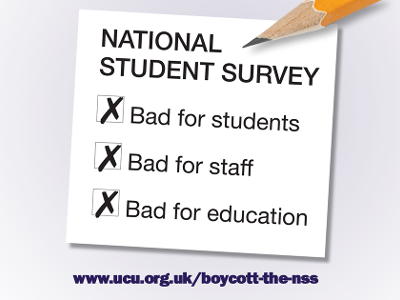 UCU ally, the National Union of Students (NUS), has called a boycott of the National Student Survey (NSS). The boycott covers all institutions where NSS is distributed and includes higher education (HE) courses that take place within further education (FE) institutions. The NUS boycott began in January 2017. The NUS boycott is in furtherance of their policy that the Teaching Excellence Framework (TEF), which itself uses NSS data, should be decoupled by the government from any increases in tuition fees. Like UCU, NUS has a long standing policy of raising concerns about the NSS both in terms of its positioning of students as passive customers and in its use for internal performance management. UCU is working closely with NUS on this boycott, reflecting our longstanding relationship, and we have agreed a joint statement with Malia Bouattia the president of NUS which is set out below. In line with our own policies we will give full support, within the law, to NUS's campaign. The practicality of how and when the boycott is to be implemented may differ between student unions. UCU and NUS have therefore agreed that our branches and local unions should seek to reach a joint position on the campaign locally in order to maximise support. Read the joint NUS/UCU statement and the FAQs below. You can view the NUS campaign page here. NUS and UCU are sister organisations committed to promoting the interests of students and staff and to defending education. Both unions believe that linking the TEF to an increase in fees will only lead to a worse deal for students. The introduction of the TEF in its proposed form will accelerate the marketisation of our sector, entrench inequality and damage the UK's academic reputation. Just as NUS has given UCU strong support in its struggle for fair pay and better job security for staff, UCU will support NUS in its fight against the increase in tuition fees and its link to TEF. That local student unions and UCU branches be asked to agree a common position in support of the NUS boycott of NSS. That UCU shares materials with members in support of the NUS boycott and that both unions defend the right of staff to express a position of support for the NUS action so long as they fulfil their contractual duties in respect of NSS. That both unions issue detailed advice to their branches on implementation of this joint position. 1. What is the NUS boycott about? The National Student Survey (NSS) is taken by final year undergraduates. The NUS boycott came about after it was announced that the teaching excellence framework (TEF) would use NSS scores among its metrics from 2017. The NUS objects to government plans to use TEF ratings to allow some universities to raise fees in line with inflation. You can download an NUS leaflet here. 3. What is UCU's position? UCU has serious concerns about the use of the NSS both for the purposes of internal performance management and as a proxy for teaching quality. Its linkage to the Teaching Excellence Framework (TEF) by the government and ultimately to increases in the cost of education exacerbate this. UCU has agreed a joint statement with NUS which you can read above. 4. What universities does the boycott cover? The boycott is intended to cover all of the UK including higher education courses which take place in FE institutions. 5. Will every student union take part? Local student unions decide whether to support the boycott in their institution. 6. How can I as a member of staff support the boycott? 7. What is the best approach for a UCU branch to take? UCU branches should first contact their local student union and try to agree a joint position in support of the boycott. The statement should be based on the national statement agreed by UCU and NUS which you can find above. Branches should also encourage members to download the UCU posters and leaflets; seek the permission of the institution to collectively inform students of UCU's support for the boycott; and monitor management's response to the boycott. 8. What should I do if I am asked not to tell students about the boycott? If you are told formally by a person in authority not to speak to students about UCU's support for the boycott you should ask the person concerned to put the instruction in writing and when you receive this you should seek the advice of your branch. While you are seeking advice you should adhere to the instruction. Please send any further queries to Matt Waddup.